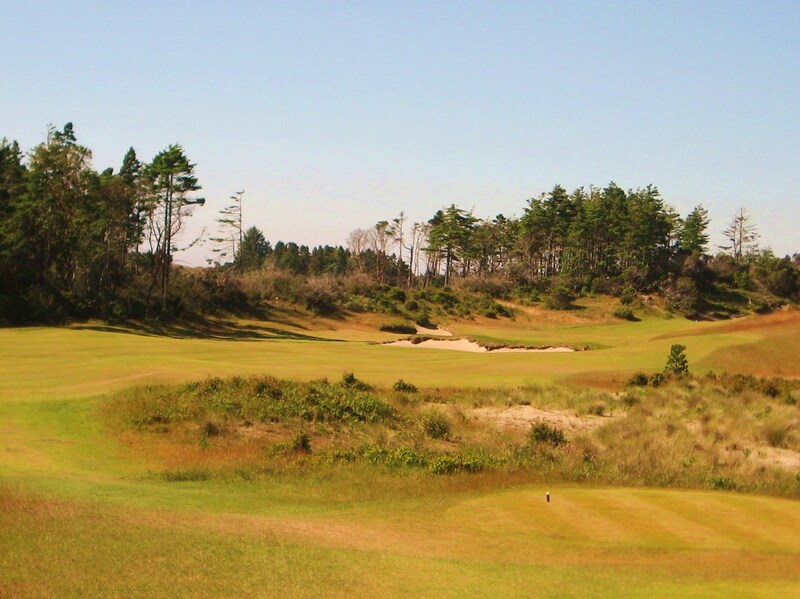 Bandon Trails was the third course constructed at the resort, and it is the only one that does not touch the ocean. 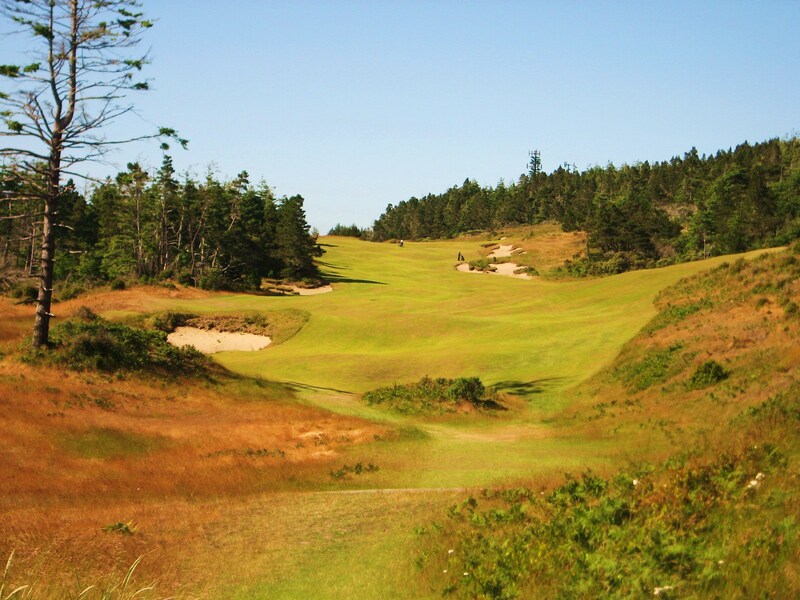 Instead, Trails takes the golfer through dunes, meadows and forest in a wonderful golfing journey that has been exquisitely routed by Bill Coore. 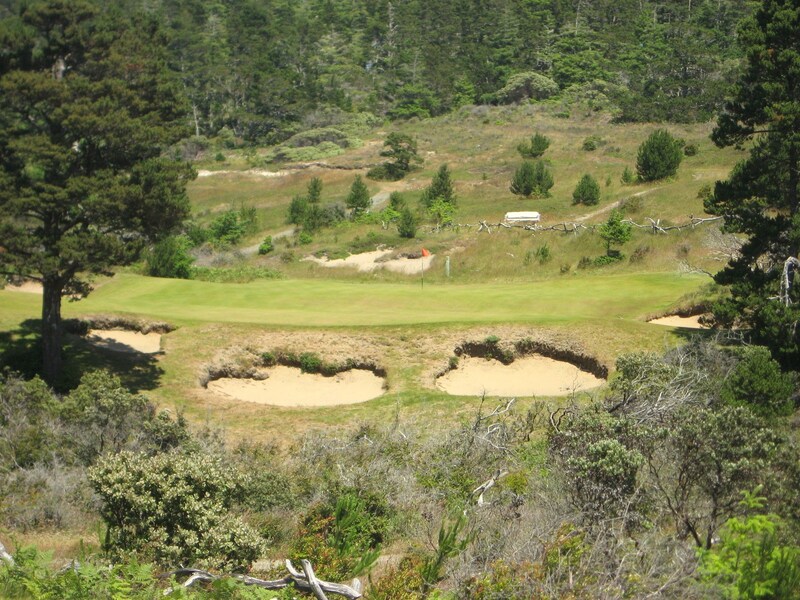 Bandon Trails is the most challenging walk at the resort, but it is well worth the effort. 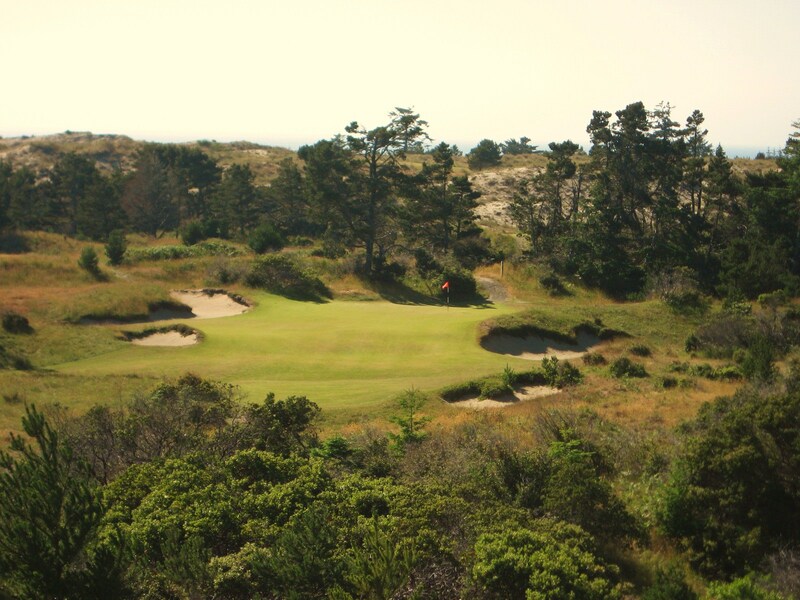 Kidd and Doak were provided with spectacular land along the bluffs above the Pacific Ocean to work their magic, while C&C were given a small amount of acreage in the dunes and a lot more in the forest. Bill Coore spent countless hours walking the property in order to develop a formidable layout. The final product at Trails is exceptional, not only in the routing, but the strategy, minimalist design, thoughtful inclusion of hazards, and impeccable conditioning. Aaron Huntley and his crew at Trails provide course conditions for golfers fit for an Open. The fairways and greens meld seamlessly and the bunkers are maintained in the natural form that the architects intended. 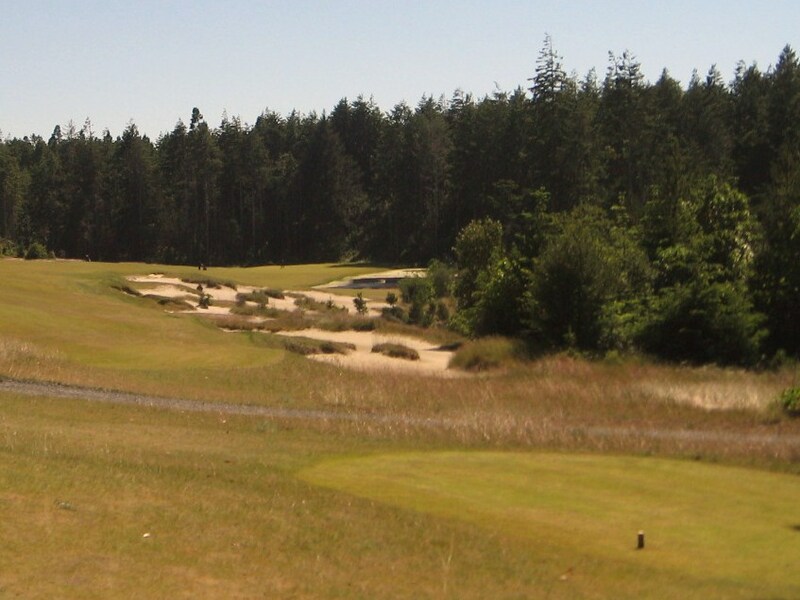 Although Pacific Dunes and Bandon Dunes receive a lot of attention, I believe that Bandon Trails is a wonderful course that competes strongly with its neighbors. The variety of terrain, brilliant green complexes and hazards, and excellent routing, make Trails a welcome challenge for any walking golfer. Looking across the 1st Green at Bandon Trails to the ocean. The tee shot at the first is usually complemented by a trailing summer wind so driver is probably not necessary. 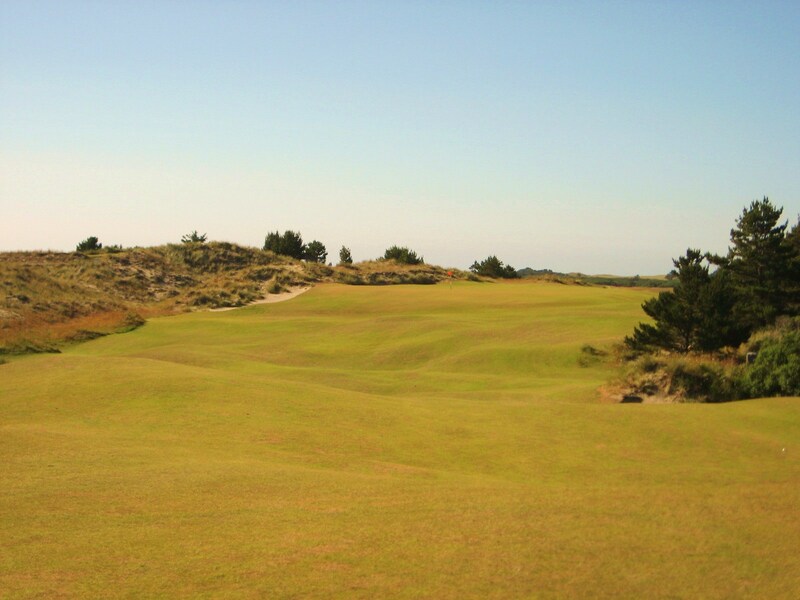 Just knock it out towards the dune that runs up the right side of the fairway. 1st Tee at Bandon Trails. The uphill approach leads to a back to front sloping green. Just aim for the middle with a short to mid-iron and try to sneak one in for birdie. Note the bunker on the left side of the photo and how the short-grass runs right into it. There will be no rough to save you from a trap at Trails, this is not your local parkland course. 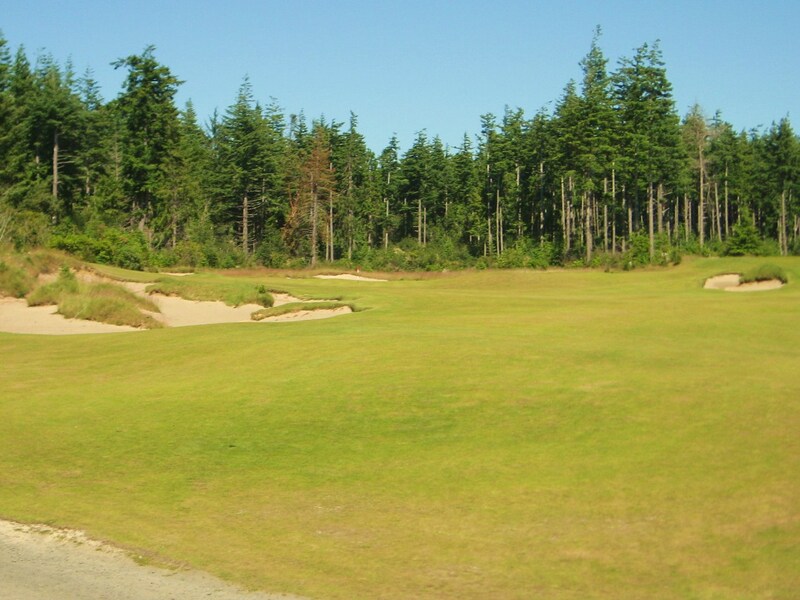 Approach to 1st Green at Bandon Trails. The trees that will be with us for the next sixteen holes are introduced on the second. 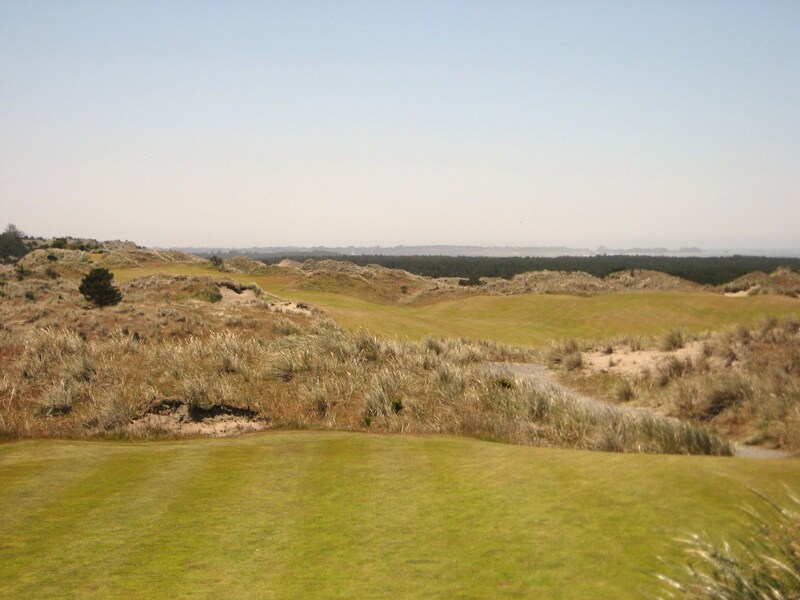 A view of the dunes and ocean on the first has been traded for trees and mountains. 2nd Tee at Bandon Trails. 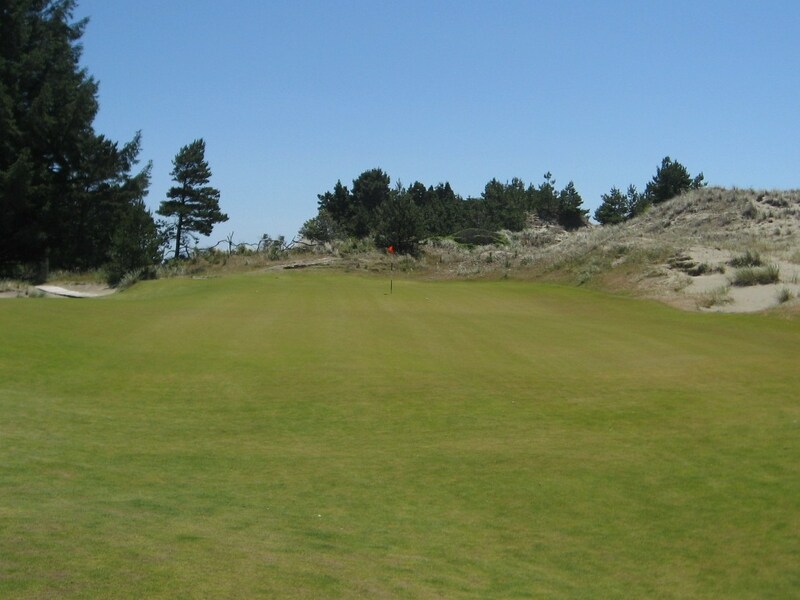 The green lies at the bottom of the dunes with trees hugging tight on the left side of the putting surface just beyond the bunkers. Short is safe here and a two putt should be manageable. 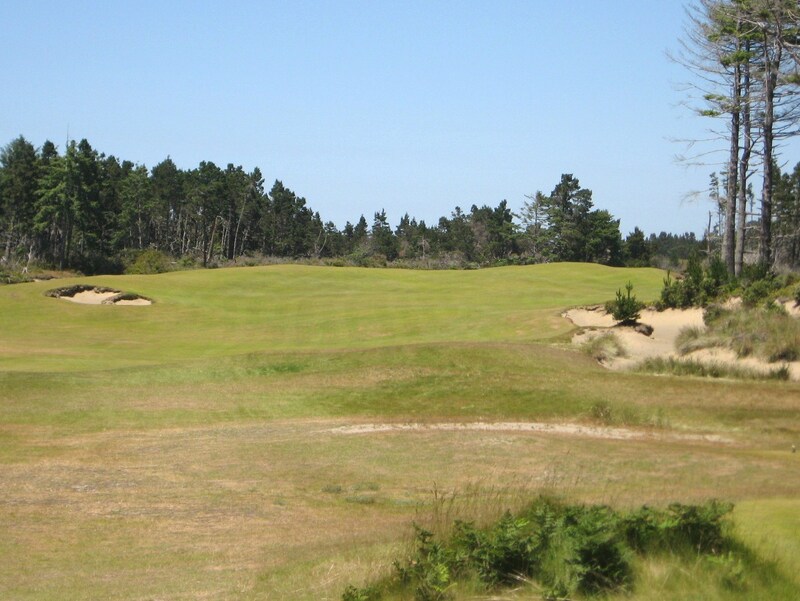 2nd Green at Bandon Trails. The golfer walks down a road to get to the third tee. 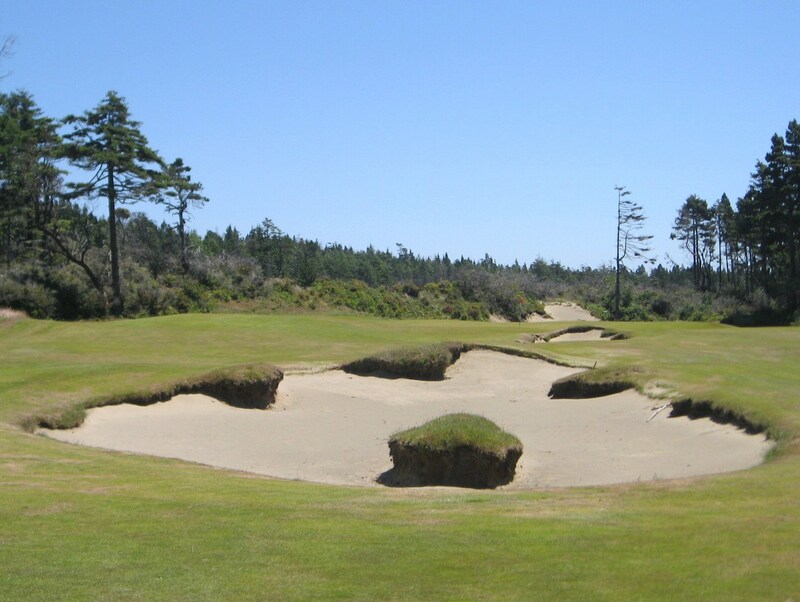 This hole continues the transition from dunes to forest through the positioning of a series of beautiful bunkers. While this hole appears rather flat and ordinary, at least for this resort, there is a lot of strategy in play and the green complex is challenging. 3rd Tee at Bandon Trails. Either side of the fairway bunkers is okay. A good drive with a nice tailwind will leave a long iron into the green, but remember, this course plays firm and fast so knowing how short of the putting surface to land the approach is key. 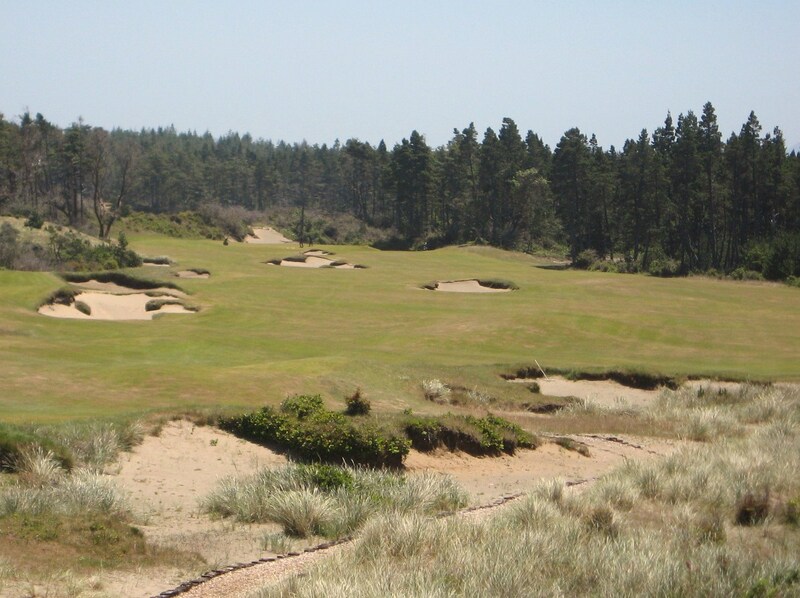 3rd Fairway and bunkers at Bandon Trails. The forebunker below lies ninety yards short of the green and will happily gobble up an errant approach. 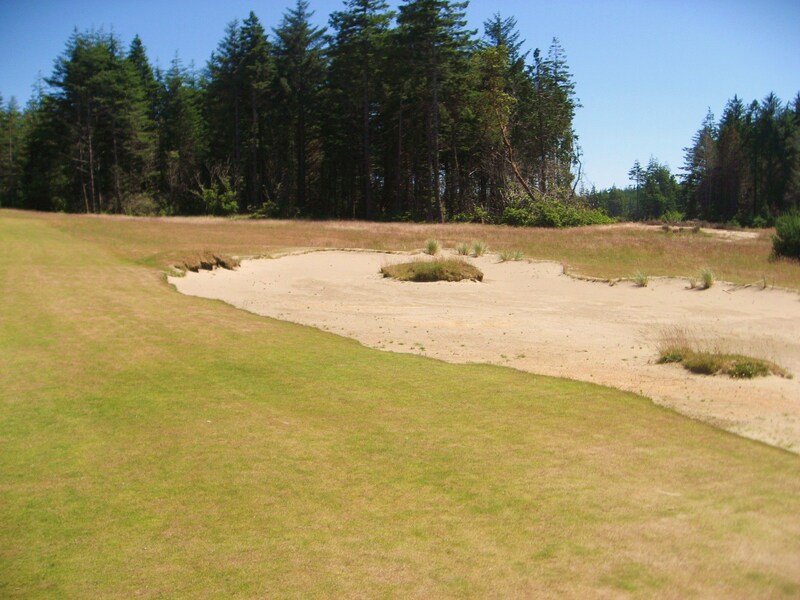 Forebunker on the 3rd Fairway at Bandon Trails. The green is only twenty-eight yards deep and falls off the back which makes it difficult to hold with a long iron approach. This is probably a par four and a half with the wind but birdie is no gimme and there is enough trouble to make bogey a regular occurrence. 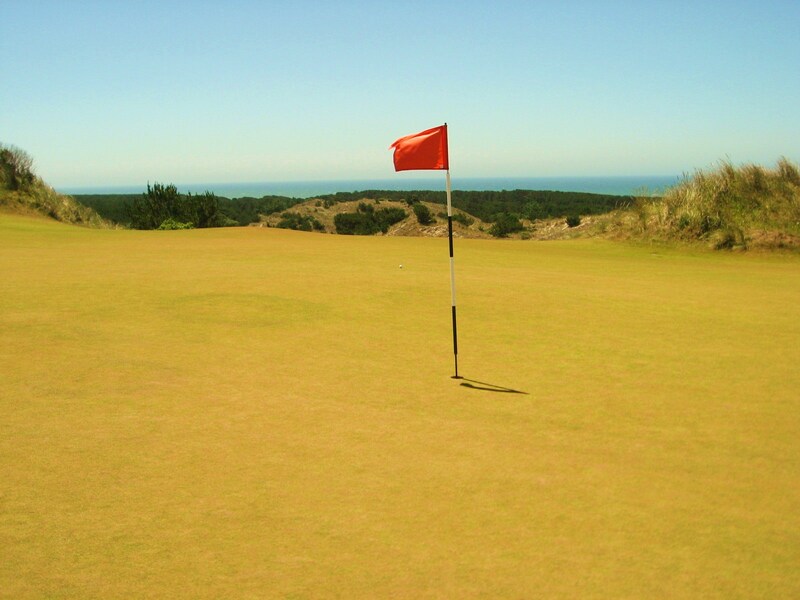 3rd Green at Bandon Trails. Into the wind, the fourth can be very challenging because it is important to carry the ridge running from short left to far right in order to have a good look at the green. 4th Tee at Bandon Trails. 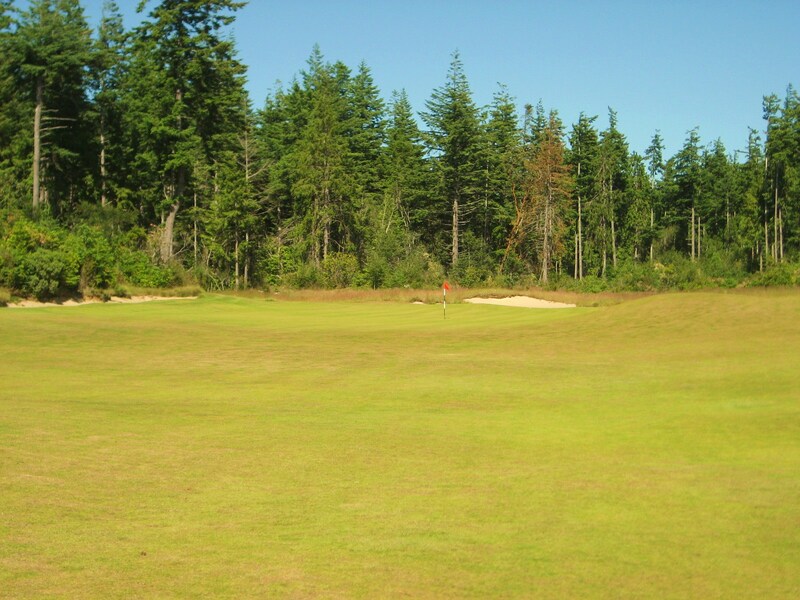 A chain of delicious bunkers run up the left side of the fairway, which culminates in a lovely small green complex. The safe bailout on the approach is short right. 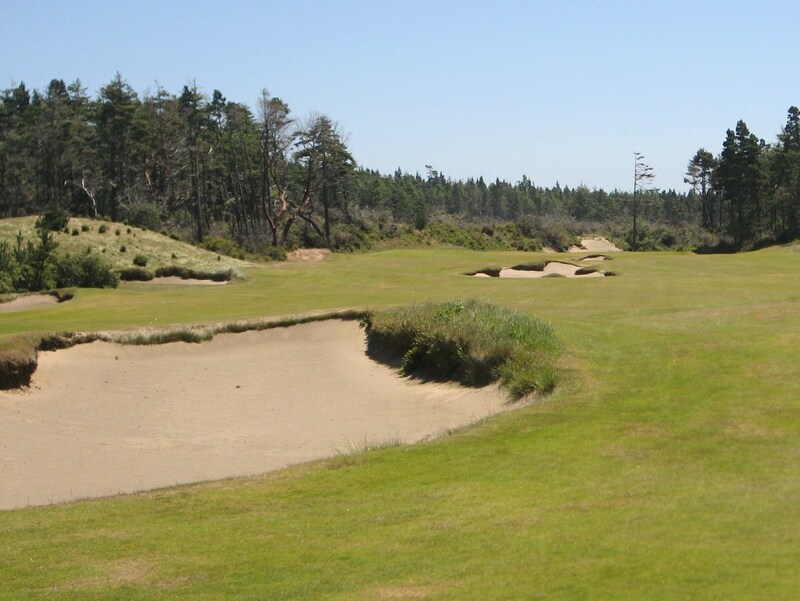 Fairway bunkers on the 4th at Bandon Trails. The bunkers are very tight to the putting surface which means anything long or short left is going to be a tough up and down. 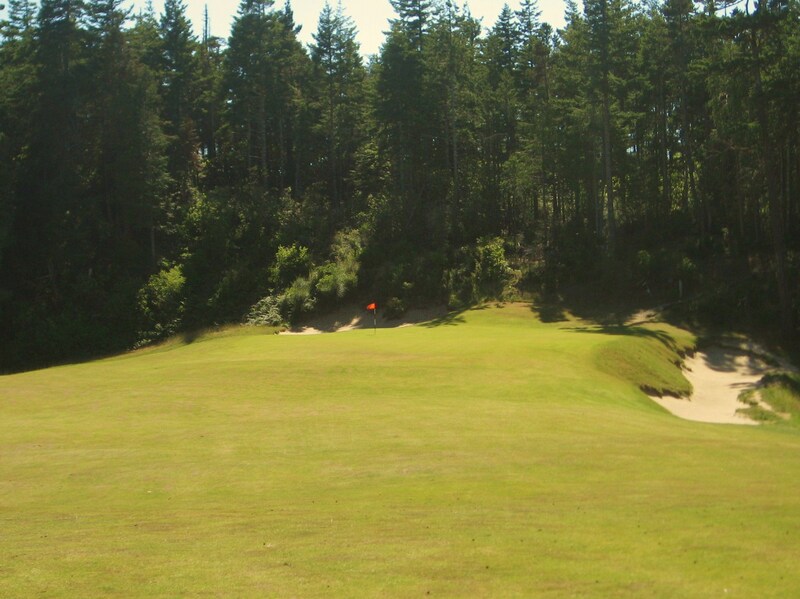 4th Green at Bandon Trails. This hole is as daunting as it is beautiful. The green is forty-eight yards deep and split into several tiers with a large swale in the middle. A birdie is possible if you are on the same section as the hole, but a three or four putt is in play if you are not. 5th Tee at Bandon Trails. The movement of the green is obvious in the photo below, this is no picnic. 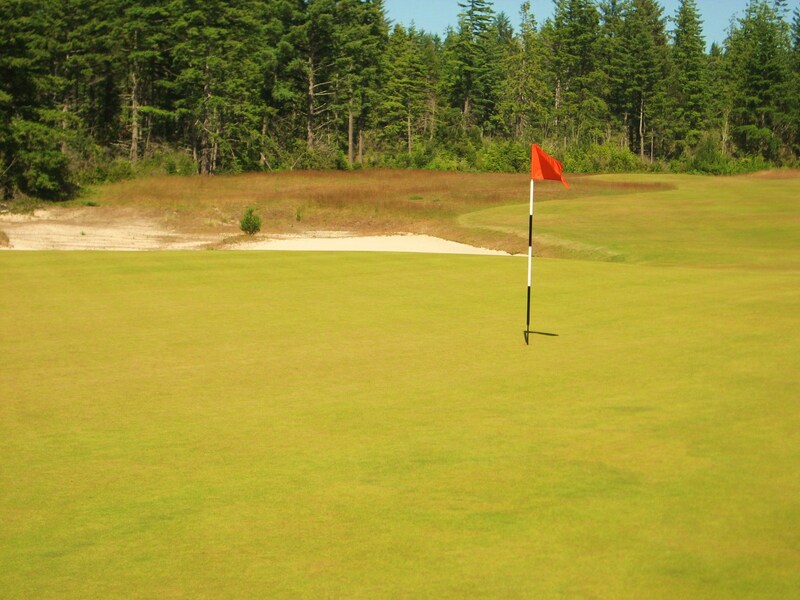 5th Green at Bandon Trails. The two shot sixth is a fun hole because a speed ramp is hidden on the far side of the bunker sitting in the middle of the fairway . . .
6th Tee at Bandon Trails. but if you hit it too far, another bunker lies in wait. Fairway bunker on the 6th at Bandon Trails. The front of the green is wide open with sand lurking on the left. The fairway and green blend seamlessly so anything short or right should be handled with the flat-stick. 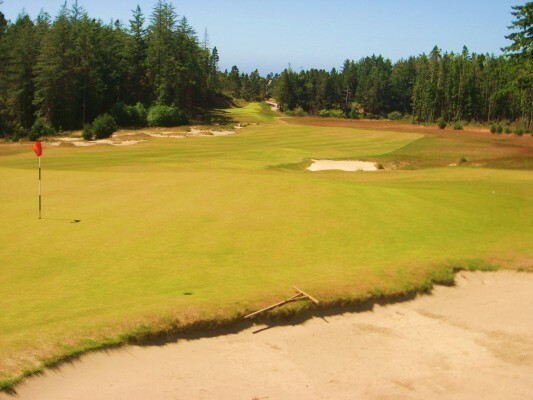 6th Green at Bandon Trails. Seven is a fairly long and uphill par four to a two tiered green strategically guarded with bunkers. The landing area is wide, but the bunkering is ominously fabulous. 7th Tee at Bandon Trails. Although firmly ensconced in the forest, we are reminded of the dunes on the first hole again and again by the grand fairway bunkers, which provide “unity” to the walk. 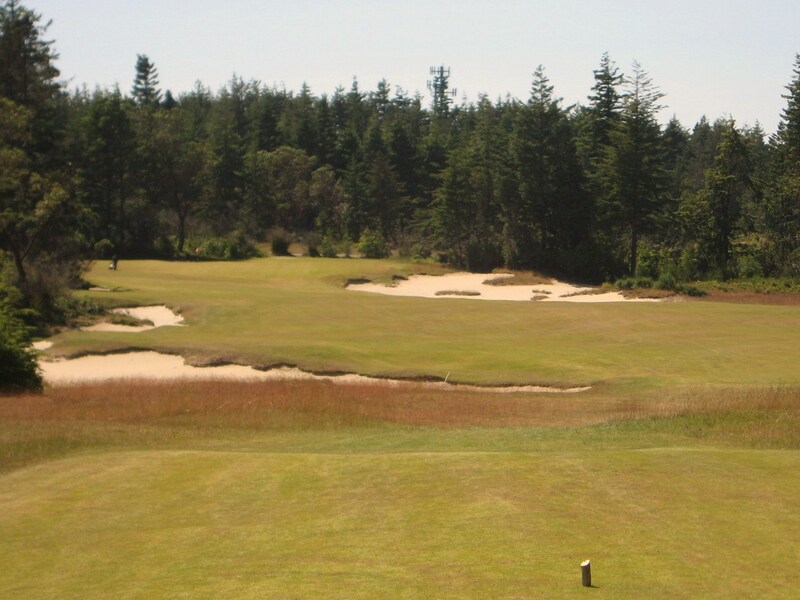 7th Fairway bunker at Bandon Trails. Looking back from the green we see many elements that make this such a great course to play. 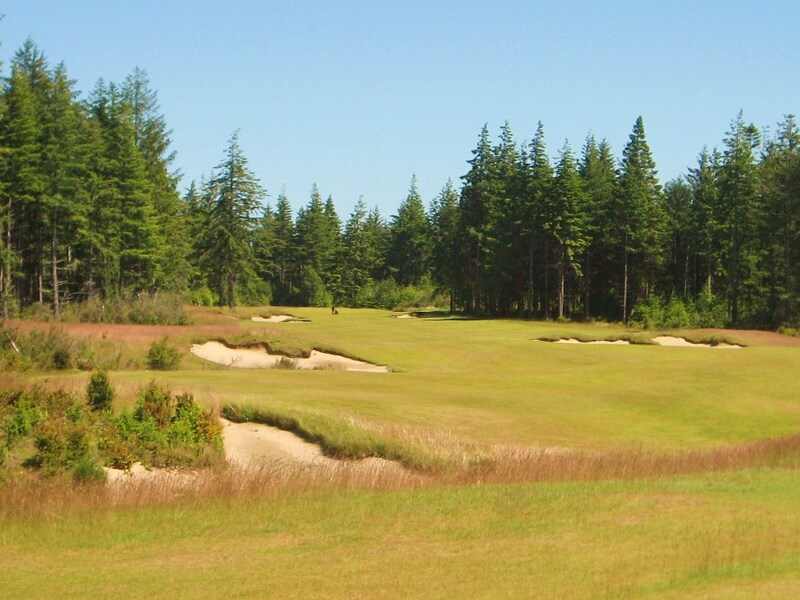 Bunkers that are tight to the putting surface, red infused fescue, and large natural looking fairway bunkers that lie close to the deciduous forest that the routing flows through. The eighth is a heavily bunkered short par four that will be drivable for some. The simple play is a mid-iron to the fairway which will leave a wedge into the undulating green. 8th Tee at Bandon Trails. There is a lot of movement to the green and bunkers surround the putting surface, waiting to punish an errant drive or approach. 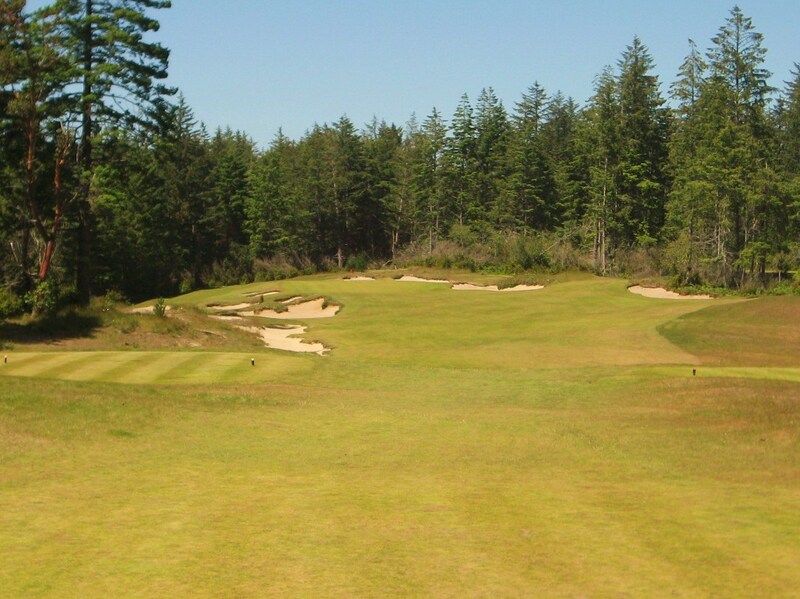 8th Green at Bandon Trails. The ninth is set in a corridor of tall trees. There is a lot of strategy to the hole both off the tee and into the green. A long drive may catch the bunker on the right. 9th Tee at Bandon Trails. It is over two hundred and fifty yards from short of this bunker to the middle of the green so a layup is probably the right play, although there is room to miss long or left provided you get past the trees. 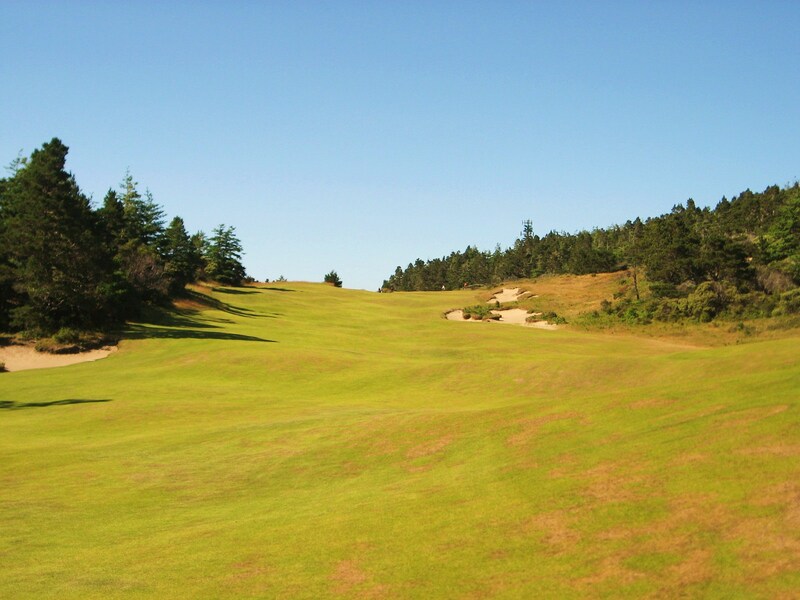 9th Fairway at Bandon Trails. 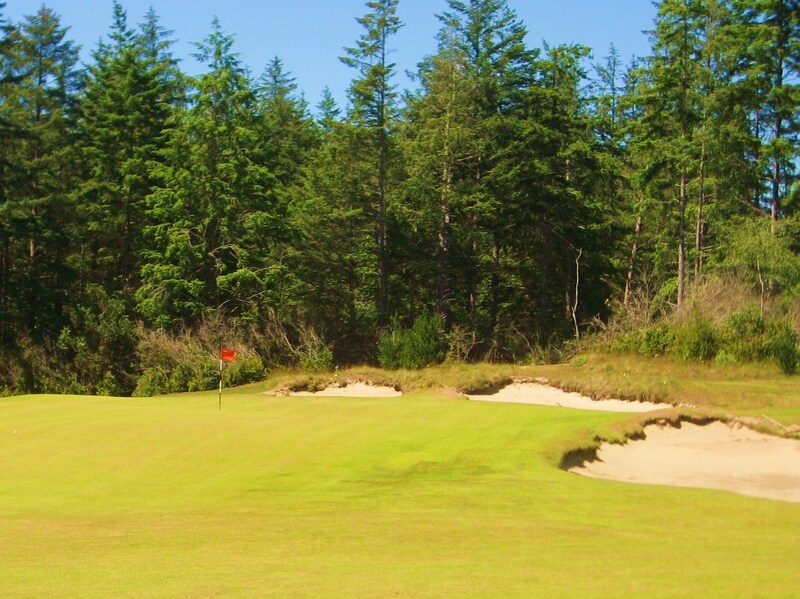 There are many examples of the outstanding attention to detail found at Bandon Trails. The decision to leave this tree fronting the fairway bunker in the photo below was clever. At one hundred and fifty yards from the green the golfer has the choice to try and bend the ball around the tree out of the sand, good luck, or punch out and try to make an up and down. 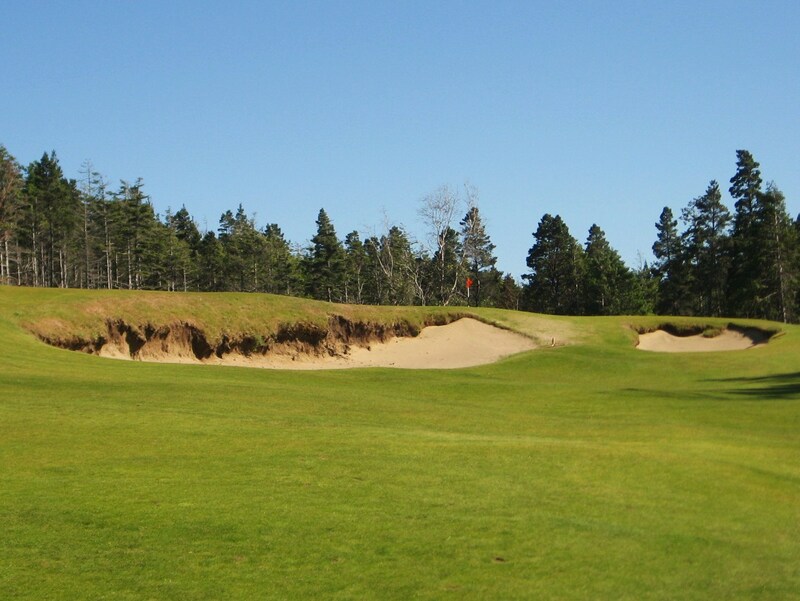 9th Fairway bunker at Bandon Trails. The green is wide open and receptive to a bump and run. There is some subtle movement to the putting surface. 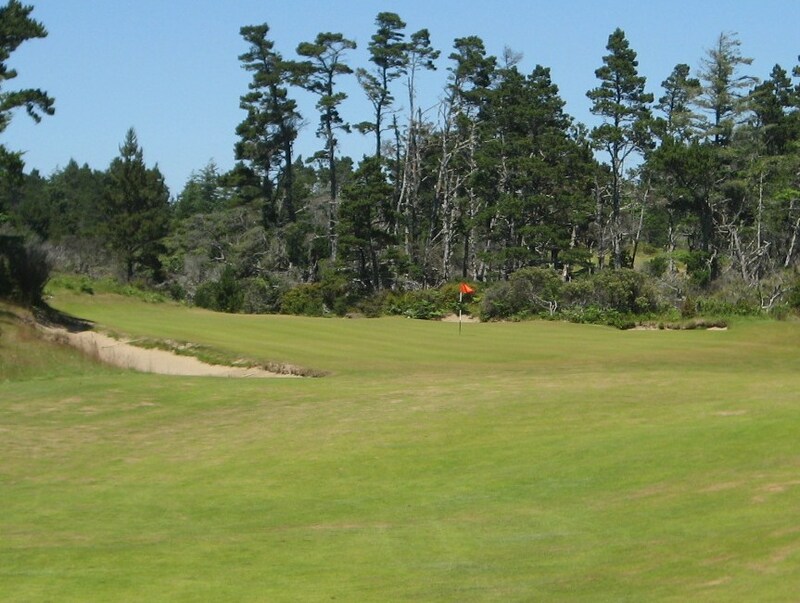 9th Green at Bandon Trails. 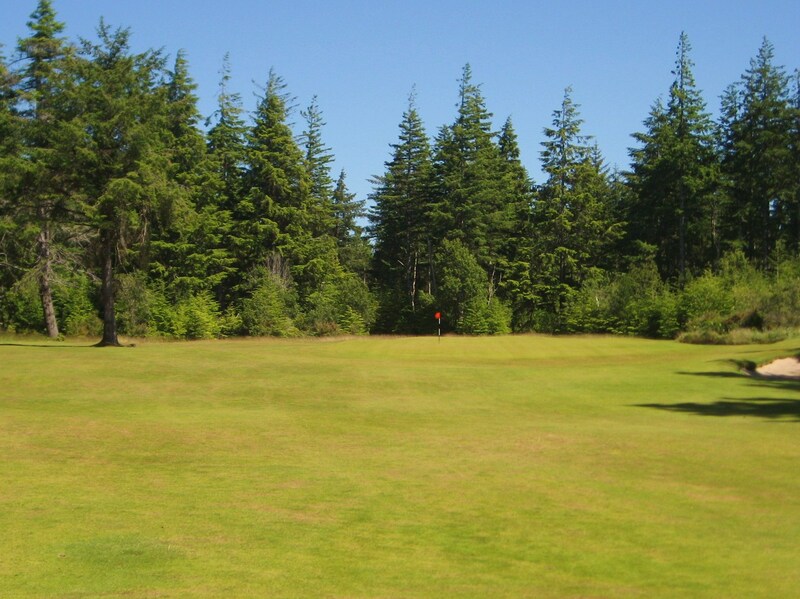 The ideal line into the green is from the left side, but that is where a two hundred yard long bunker and dense forest await a hooked or pulled drive. The turf island in the distant bunker is a good aiming point to avoid trouble. 10th Tee at Bandon Trails. The fairway bunker on the left side of the pin begins about seventy yards short of the green and runs from front to back along its edge. The spectrum of colors found on Trails is striking. 10th Green at Bandon Trails. The eleventh is the only hole on the course with water in play. It runs along the right side from the waste area to the green. Stay left off the tee, like way left because your drive will kick to the right, and you will have a good line into the green. 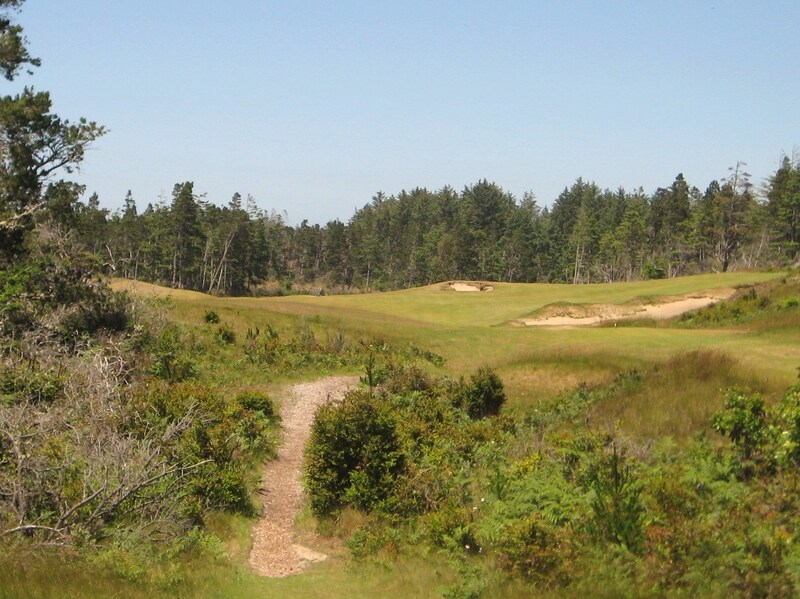 11th Tee at Bandon Trails. The waste area on the right side is a gnarly site and should be avoided. The tiger golfer may try to carry the edge of it to leave a short approach, only to find that their drive has kicked right into the pond. 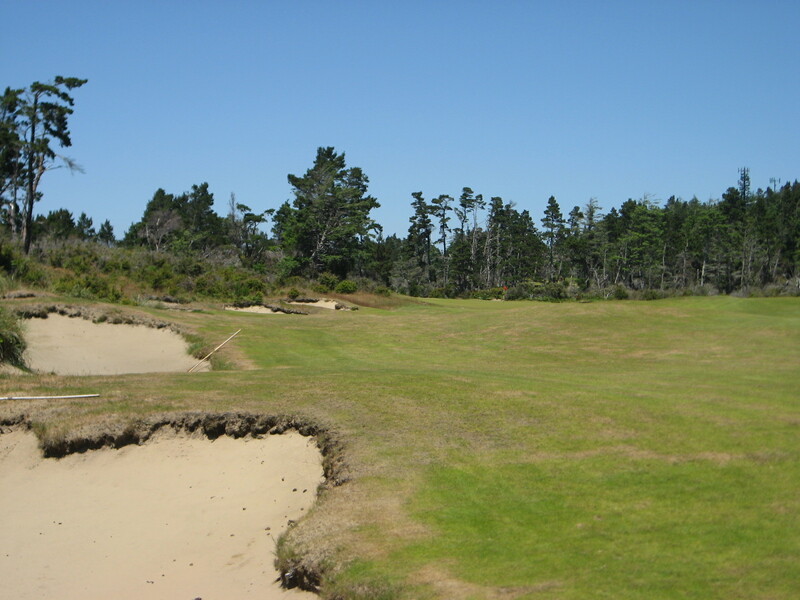 Waste area on the right side of the fairway on the 11th at Bandon Trails. The one shot twelfth can play very long depending on the wind. The green is receptive to a long iron or fairway wood that runs onto it. The right side looks like the appropriate bail out . . .
12th Tee at Bandon Trails. but a large mound makes a chip, pitch or putt very difficult to stop close to the pin. This is an example of a one shot hole on flat terrain that provides a great deal of interest despite little earth moving by the architect. 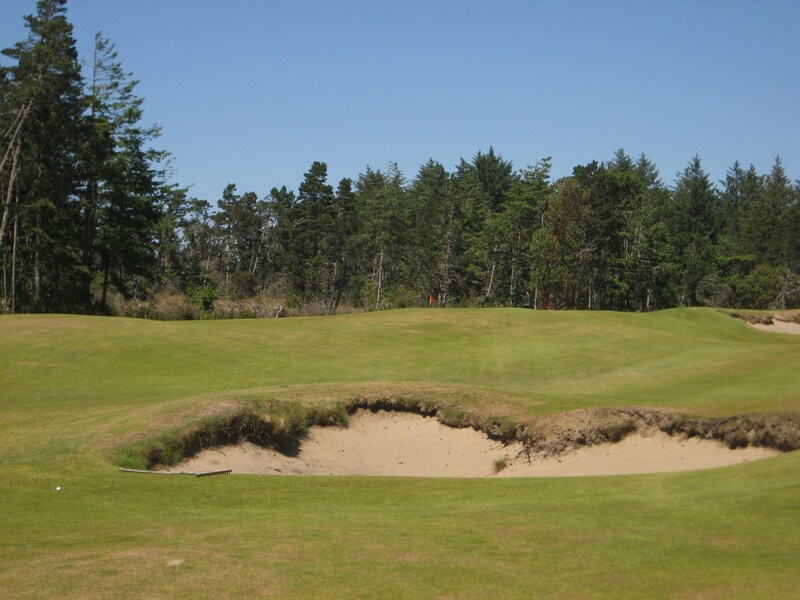 12th Green at Bandon Trails. The two shot thirteenth is another really fun hole. The best line into the green is from the left side of the fairway, but avoid the large bunker. 13th Tee at Bandon Trails. 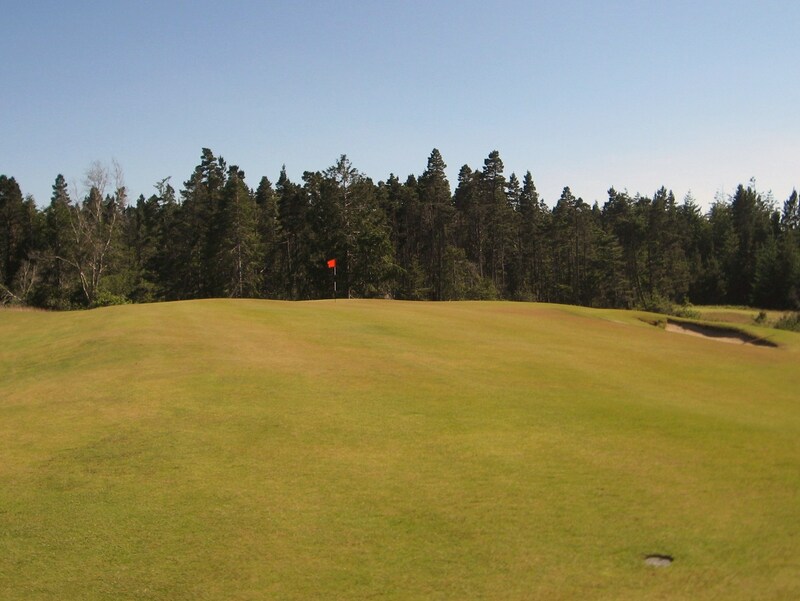 Having placed a great drive, the second is an all or nothing wedge to a convex green that has a cavernous bunker on the right, a steep fall off on the left, and a deep bunker at the back. If you are on the putting surface a birdie is possible, but if you miss on either side, be careful not to ping-pong your ball from one side to the other. 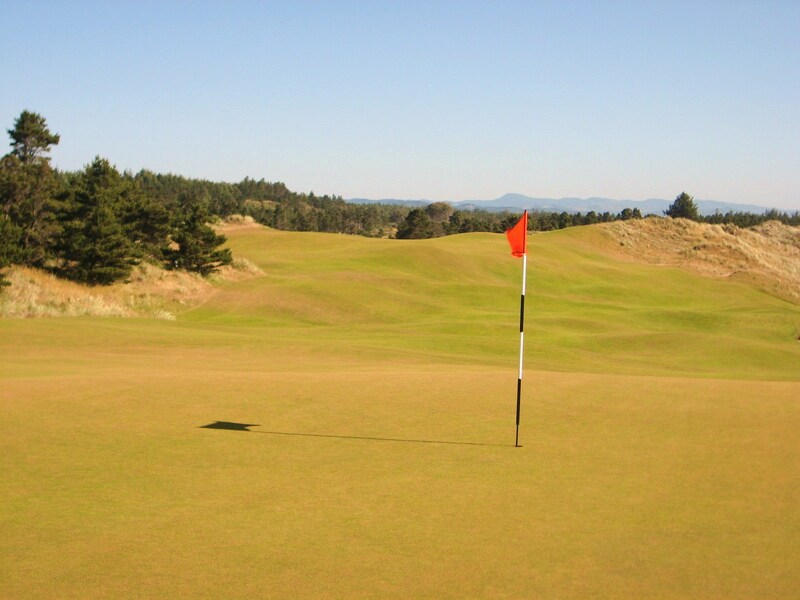 13th Green at Bandon Trails. After a really long uphill walk through the trees, or a nice shuttle ride, the golfer steps out onto the fourteenth tee. 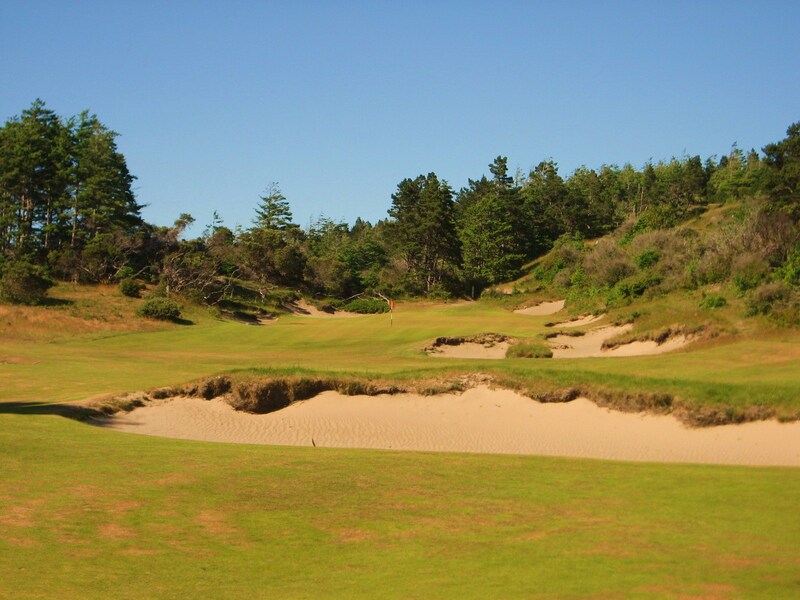 Apparently, this is the spot where Mike Keiser decided that Bandon Dunes would be his walking golf mecca. This is probably the one vista on Trails that can rival those of the ocean holes of the Dunes courses. The tee shot presents a quandary. Attempt to drive the green or try to lay up on the left and leave a downhill pitch to another green that slopes away on every side? 14th Tee at Bandon Trails. A miss to the right will leave the golfer with an extremely difficult pitch to the green from the short grass. If you duff it and put it in the sand, your bunker shot will be just as challenging as the pitch. If you send it long, you will be chipping back up to the putting surface from the far side. 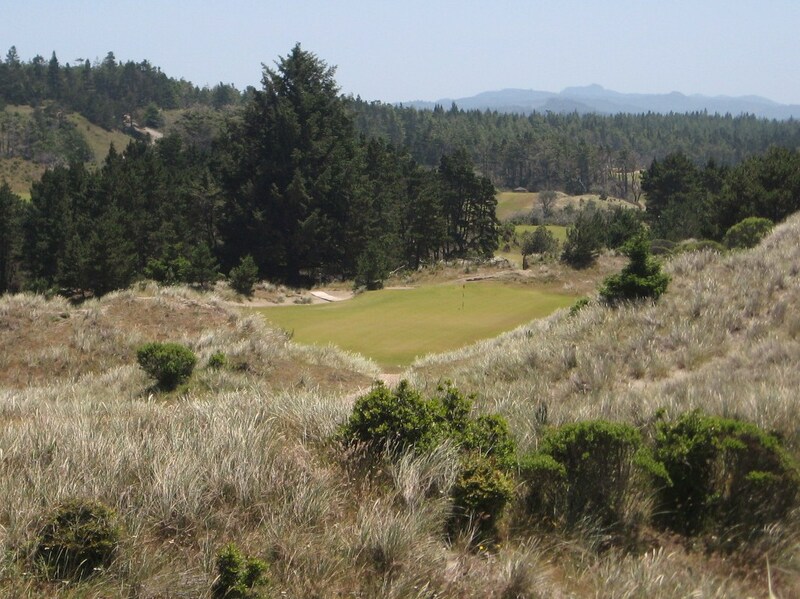 Right of the 14th Green at Bandon Trails. Once again, where does the fairway end and the green being? Maintenance brilliance. From this position, a pitch short of the hole and a good run at birdie is the right play. 14th Green at Bandon Trails. Fifteen is another relatively flat hole that is welcome after the big elevation change on fourteen and the long uphill slog that awaits on sixteen. It also feels like we are moving back into the meadows and out of the deep forest, as the run home begins. A drive short of the fairway bunker is perfect as it leaves a short iron into the green. 15th Tee at Bandon Trails. An accurate short iron to the front of the green is the safe play as there is trouble everywhere. 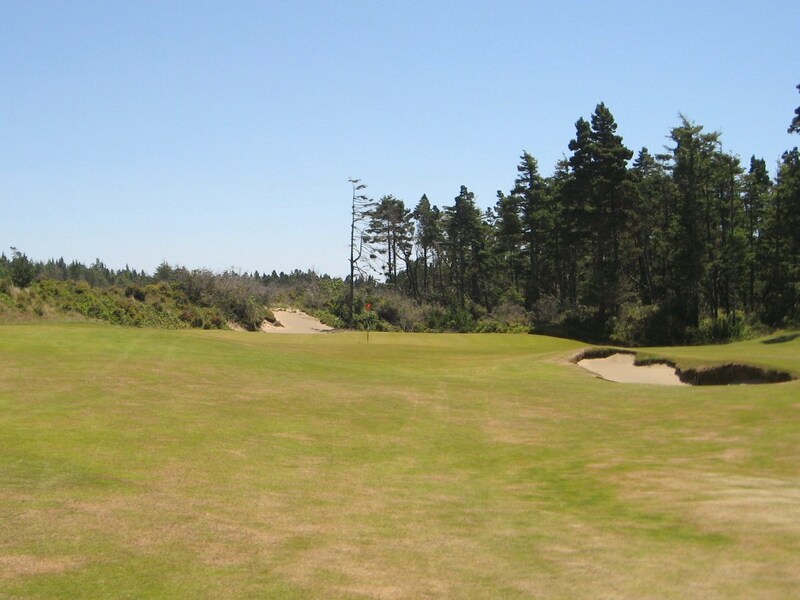 15th Approach at Bandon Trails. The fine fifteenth green complex has a ring of bunkers, a false front and an undulating putting surface. A birdie is a great score and par is more than acceptable. 15th Green at Bandon Trails. The sixteenth is an absolute beast of a par five into the wind. The hole plays uphill and requires three good pokes to get it on the green in regulation. 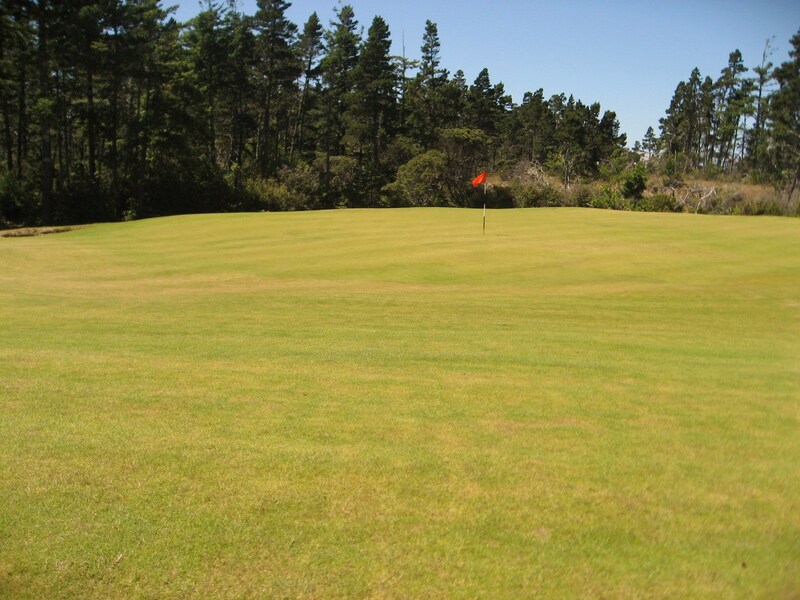 The fairway is quite wide and a drive right will funnel back into the middle of the fairway, but may leave an awkward lie as the short grass is undulating from tee to green. 16th Tee at Bandon Trails. 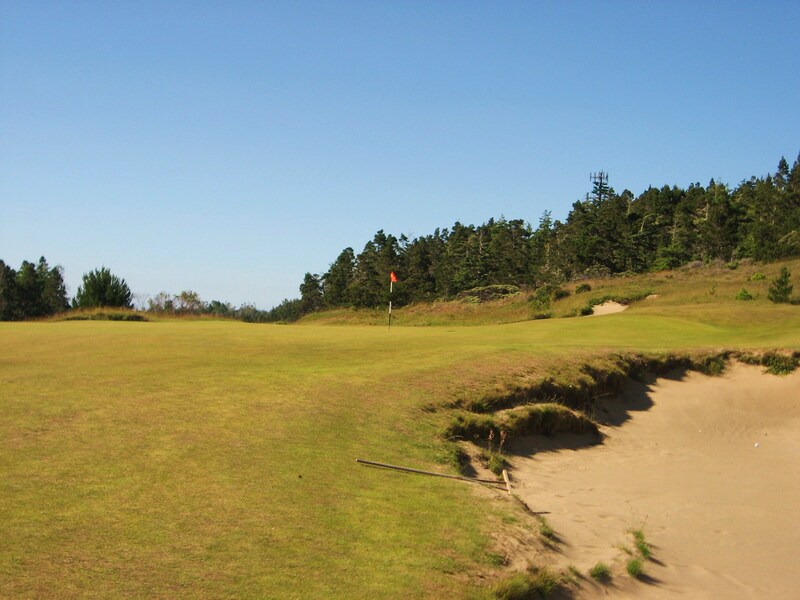 At this point in the round, the golfer may be tired and beaten as the journey around Bandon Trails is of epic proportion. Focus your energy and smash a strong second up the middle to leave a short to mid-iron into the green. 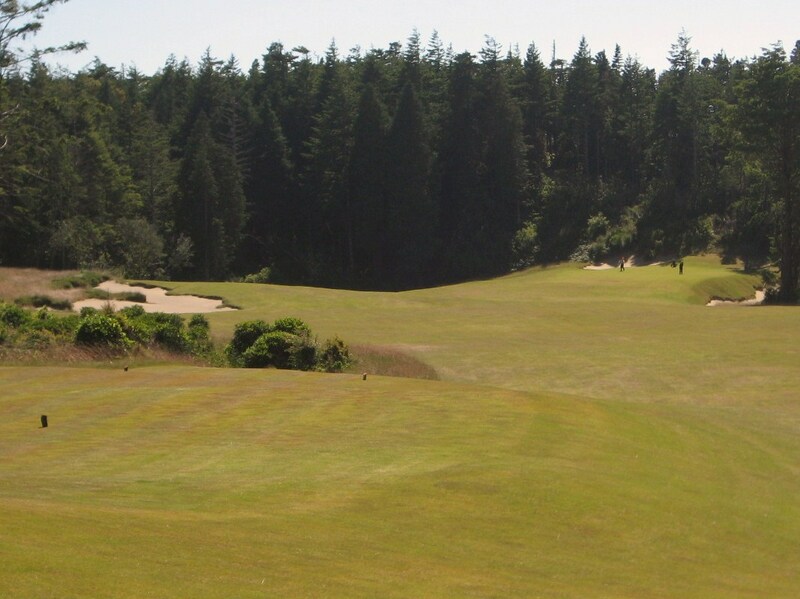 16th Fairway at Bandon Trails. 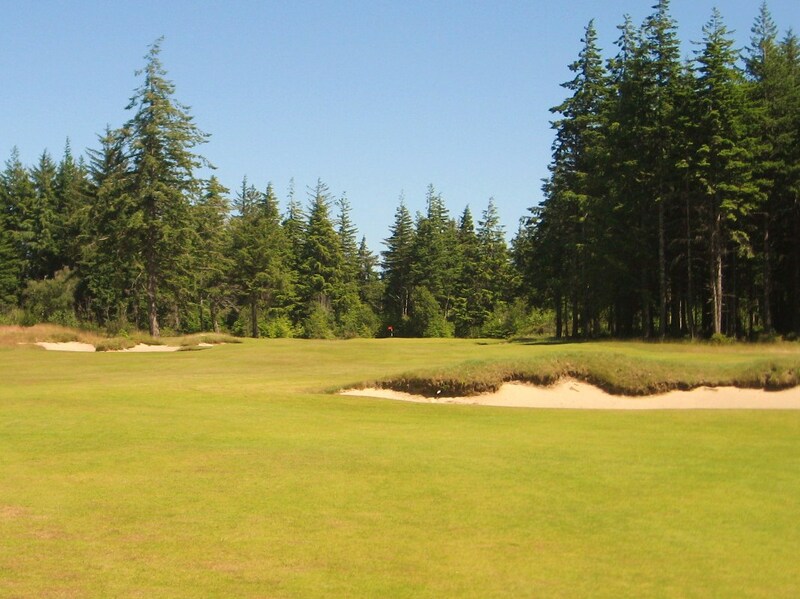 Anything short of the green may run into this deep and unforgiving bunker. There is a little room on the left to bail out, just get it onto the flat ground at the top of the hill. 16th Green at Bandon Trails. Seventeen often plays into a cross-wind that rips from right to left across the green making club selection and direction a daunting task. 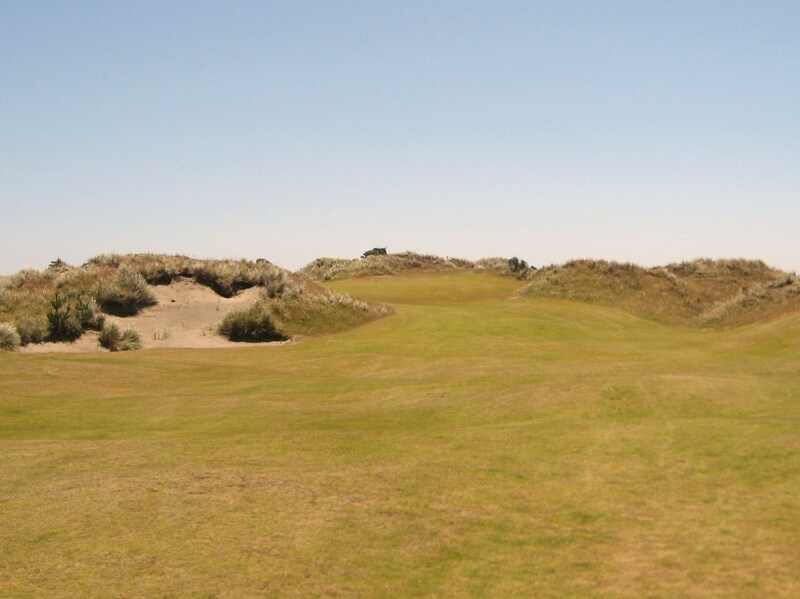 Having just been beaten up by sixteen, the seventeenth can add to the agony as bunkers, a false front, and long grass await any tee shot that does not fly straight and true to the middle of the green. 17th Hole at Bandon Trails. The drive at eighteen is into the wind, partially blind, uphill and across the road that you crossed between the second green and third tee. The golfer returns to the dunes and the ocean air for the final leg of the journey. 18th Tee at Bandon Trails. A short drive will have a long way to go but if you crush it off the tee and keep it left a short iron will leave a manageable second to the plateau green. 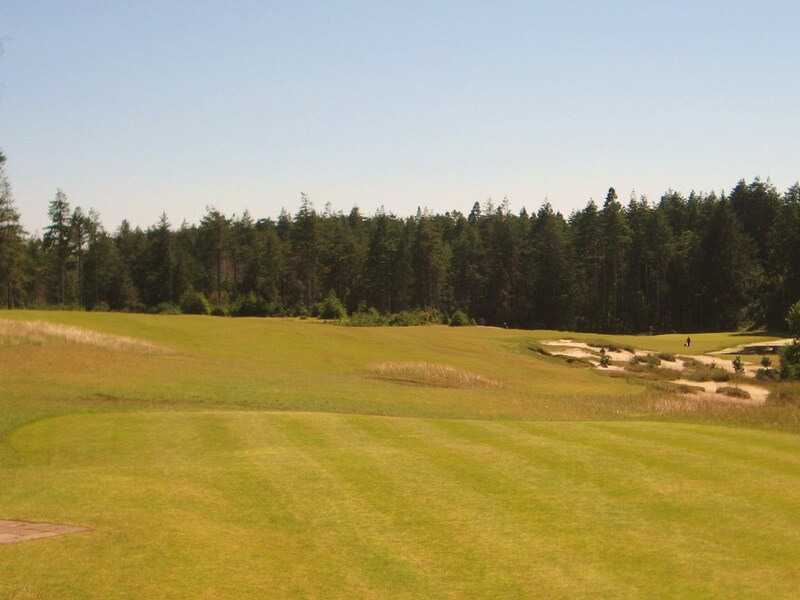 18th Fairway at Bandon Trails. 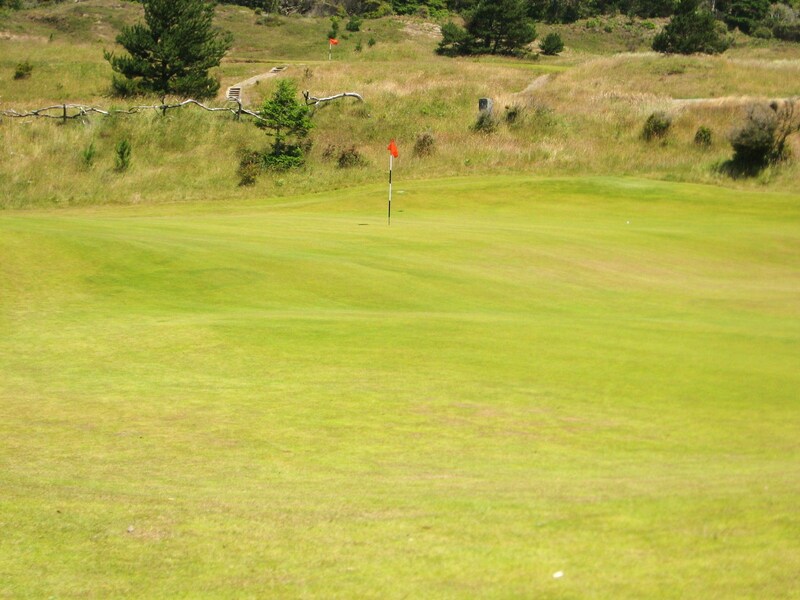 Looking back from the eighteenth green, having just completed your walk through dunes, meadows and forest, the walking golfer is probably fairly worn out but exhilarated. A cold beverage is definitely in order! 18th Green at Bandon Trails. 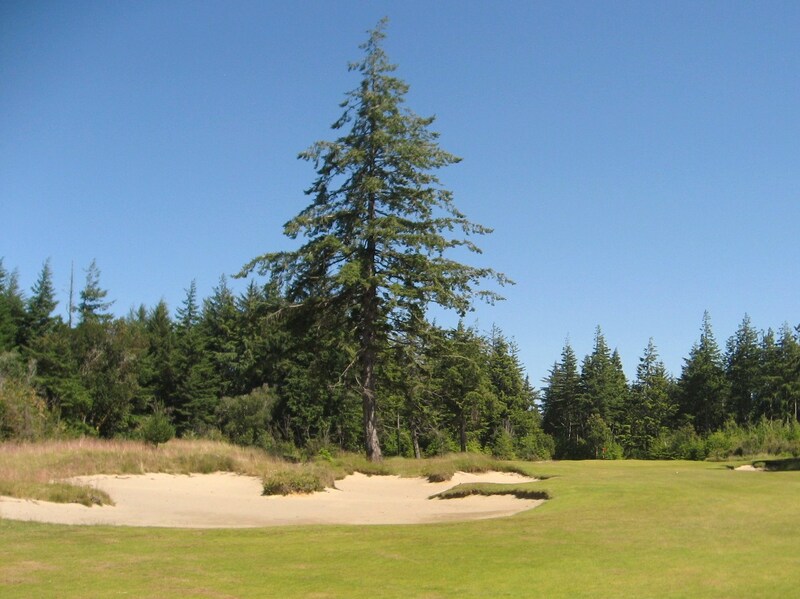 Bandon Trails is unique at the resort because it does not play near the ocean. If it was at any other resort in the country it would be the crown jewel, but because of the neighbors it receives little press. Trails is a brilliant course, and I would encourage every golfer who visits the resort to take it on at least once during their trip. Of the four courses at the resort, this is probably the best one to take a caddie, especially if you are playing thirty-six holes a day. There are a couple of long green to tee transfers and some steep elevations changes on the final four holes. 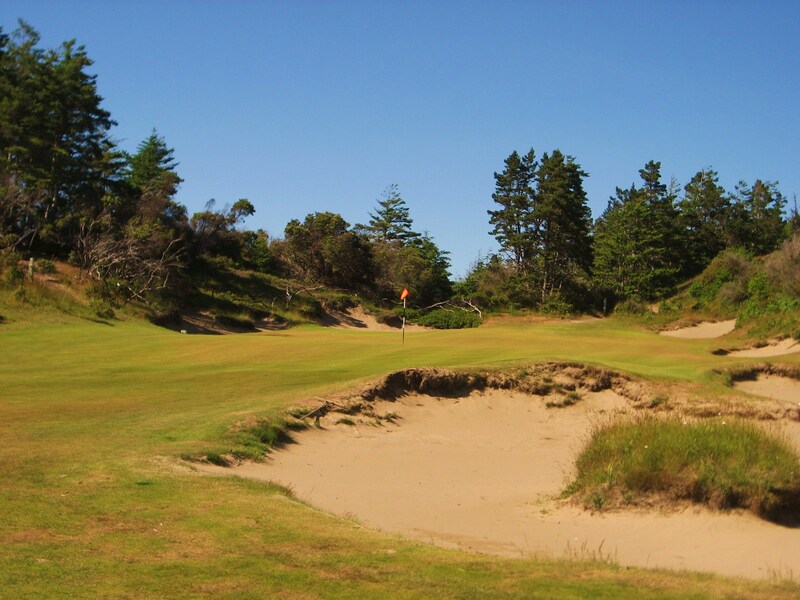 That being said, I pushed my cart across Pacific Dunes and Bandon Trails in the same day and was ready for more. As they say, it is “all about the golf” so make the most of your time at the resort. 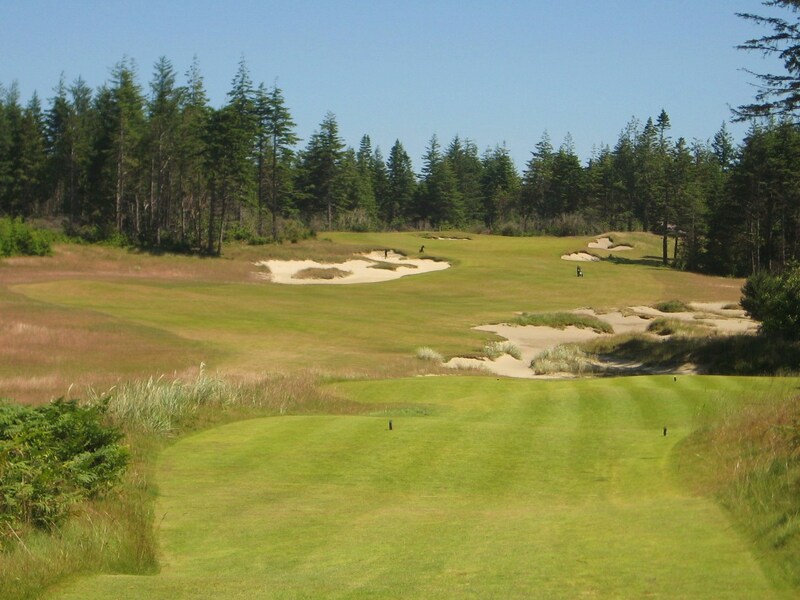 Bandon Trails is not the easiest course to walk, but like Chambers Bay, it is “manageable”, well worth the effort and I believe it is possible to walk a couple of rounds there in a day with or without a caddie. Thus, Bandon Trails receives 2.75 out of 4 for Walkability. As a walking golfer, it is always important to understand your fitness level, so pay the extra money for a looper if necessary in order to walk the Trails. In terms of Architecture and Aesthetics, Coore & Crenshaw, and team, have done an incredible job integrating the available terrain in a spectacular routing with challenge and interest on every hole. The course deserves a strong 4.0 out of 4 in this category. Trails also receives full marks for Strategy and Playability. While the difficulty of this course is certainly higher than the others, a good strategy will allow any golfer to play to his handicap. Most landing areas off the tee are wide and there is room to run the ball onto almost every green. 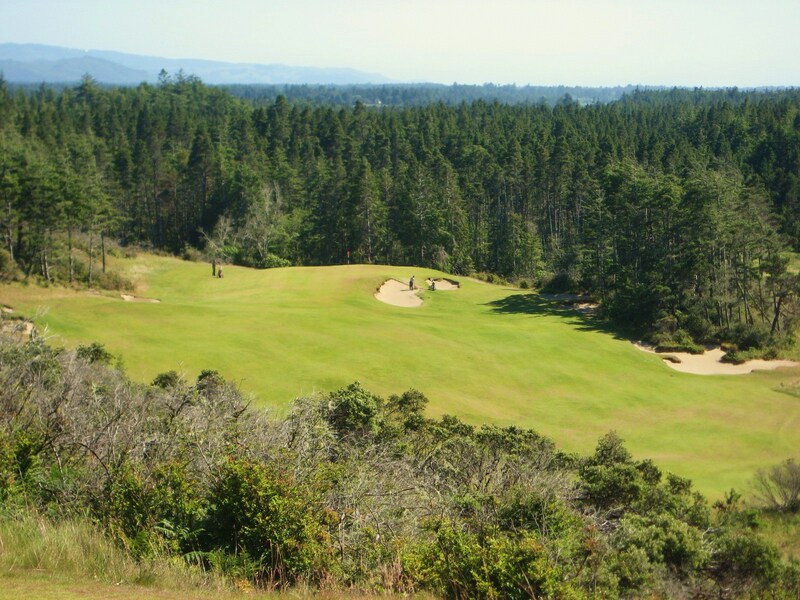 More than any other course at the resort, it is important to be realistic about your abilities at Bandon Trails so make sure you play the appropriate tees. 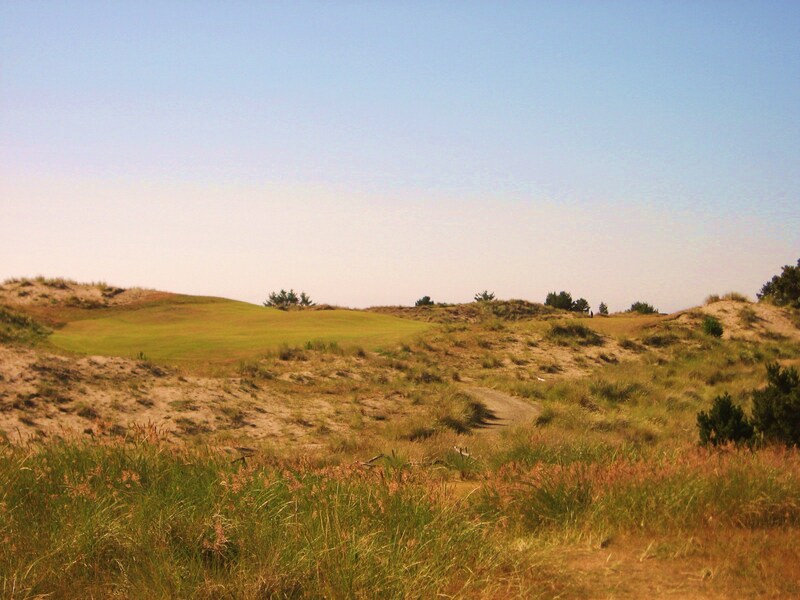 Although Bandon Trails is not on the ocean, it is no weak sister to the Dunes courses.